There are all kinds of teachers. Caffeine addicts, noobs, drones, oldies...but every once in a while, there's a good one. Ms. Bixby is beyond good. For Brand, Topher, and Steve, she makes learning worthwhile, in school and in life. With her pink-striped hair, she's one of a kind. 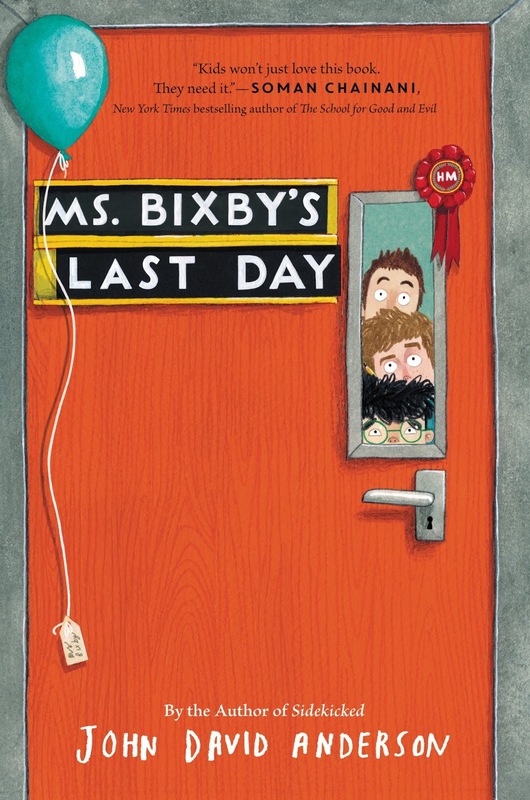 So when Ms. Bixby announces suddenly that she cannot finish the school year due to illness, the three boys take it upon themselves to give her the last day she deserves. The plan is risky—dangerous and illegal, even—but they're determined. Through the three very different stories they tell, we begin to understand what Ms. Bixby means to each of them—and what the three of them mean to each other. This. I laughed, I cried, I celebrated, I mourned. Yes, this is one of those books. Anderson has done a fabulous job. On the one hand, he nailed boy's middle-school humor. I laughed a lot—booger scenes, girl cooties, big sister problems, and more. Great for the target audience! But man, it's still got a heavy dose of sad. And yes, Anderson does an expert job of interweaving the two, but I still didn't like the sad. (Why could none of the boys have a good home/family life? Why was the plan they carried out have to be fraught with so much failure? Gah!). I understand the need for the contrast, and it definitely added amazing depth to the story and characters, but my personal reaction was one too many sighs. But! That's really my personal reaction. Honestly, the writing, the characters, the story are so well done. The characters! Man, reading from each of the three boys' perspective reveals a lot, including (but not limited to) helicopter parents, absent parents, depressed parent, amazing talents, insecurities galore, imagination, happiness, sadness, and just a hint of LGBT exploration. These guys were well done. In the end, I reminisced about my great teachers, mourned the cruelty of cancer, and sighed a sad sigh among the laughs. Good for old and young alike, give it a try! Readalikes include Fish in a Tree and Wonder.